The key to making this drink look good is to blend the ingredients separately. Blend the strawberries and rum together and pour in to a Hurricane glass. 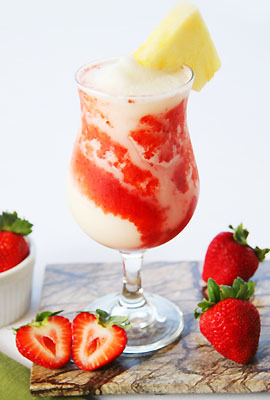 Next rinse out the blender and blend the banana, pineapple juice and coconut cream in ice. Add the creamy mix on top of the strawberry rum mix. When you blow down your straw, or stir the drink it simulates a ‘lava flow’. Very fun!